Horsewoman, Fullface belongs to an unfinished series on the four seasons that Édouard Manet painted in the last two years of his life, commissioned by his friend Antonin Proust, then Minister of Fine Arts. The theme of the four seasons represented by female figures was relatively common in the history of Western painting. Manet’s own sister-in-law, the painter Berthe Morisot, had produced one of these cycles featuring young women attired in fashionable dress. It was also habitual in Japanese prints — which were so widespread at the time — for the seasons to be symbolised by features of courtesans. The artist was seriously ill when he began this cycle and only managed to fully complete the first of the paintings, Spring, for which the famous Comédie Française actress Jeanne Demarsy posed. Manet exhibited the painting with great success at the 1882 Salon together with the masterpiece from the end of his career, A Bar at the Folies-Bergère. Méry Laurent was the sitter for Autumn, which he did not have time to finish. Laurent, a great friend of Manet’s at the end of his life, had arrived in Paris at the age of seventeen to make her debut as an actress and had soon become famous, frequenting the artistic and literary circles of the capital. She even inspired Marcel Proust’s character Odette Swann in Remembrance of Things Past. For the Horsewoman in the Museo Thyssen-Bornemisza, which may perhaps have been intended to represent summer, the sitter was Henriette Chabot, a less known young woman than the others, the daughter of a bookseller of the rue de Moscou. Encouraged by the success of Spring at the previous year’s Salon, Manet put particular effort into this work with the intention of showing it at the Salon of 1883. He produced three versions: a largely unfinished Horsewoman in Profile in the same format; another Horsewoman, Fullface that was larger in size; and this painting. Of the three, only the latter was chosen for the posthumous exhibition of the artist’s work organised in January 1884 at the École des Beaux-Arts, where it was shown for the first time hung next to Spring and Autumn. In the whole series Manet pays great attention to the sitters’ clothing, in accordance with Baudelaire’s belief that fashion was a key element of modernity: while Jeanne Demarsy sported a floral dress that was the latest fashion and her retroussé-nosed beauty stood out against a flowery background, Méry Laurent wore a modern brown fur jacket commissioned by Manet himself from the famous couturier Worth. 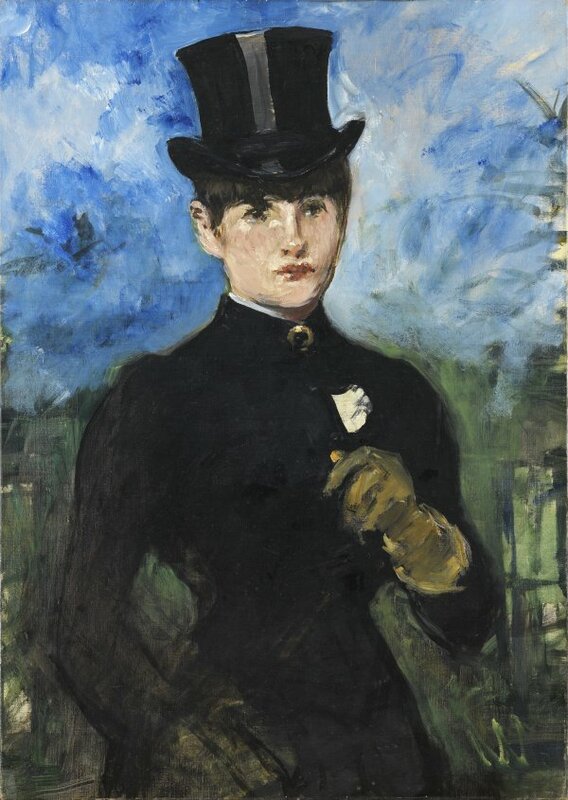 In the Museo Thyssen-Bornemisza painting the androgynous-looking young Chabot wears a riding outfit which, according to a testimony of Antonin Proust, Manet had borrowed from his friend the painter Gallard d’Épinay. The darkness of the costume allows the painter to show off his magical mastery of black tones which, contrasting with the pale background, recall works by Frans Hals. The handling of light may be considered Impressionist, but in Manet the pursuit of luminosity goes hand in hand with a study of coloured surfaces, outlines and textures. The fact that the work is unfinished clearly shows how confidently it is executed, without hesitation, and the skill with which Manet succeeded in capturing and conveying the essential.